Sometimes I say things that tick people off, because I don’t shy away from controversy and I tell it like it is. So I’ve been thinking about this for a while, and I have to come clean: I’m just not that into using essential oils. I’ll stand here while you get the rotten tomatoes ready. Don’t get me wrong, I’ve used essential oils for years, but when it comes to keeping my family healthy, they’re not really at the top of my list. Let me explain. There are a few specific reasons I’m not that into using essential oils, and below, I’ll lay ’em all out for you. While they are natural and smell lovely (ok, some of them do- have you ever smelled vetiver? Stiiinky! ), I feel that a lot of people simply replace their over the counter meds with essential oils. Instead of Rolaids, they rub a digestive blend on their tummy. Instead of acetaminophen, they rub a little peppermint on their temples (I’ve even written about doing that here). Allergy meds have given way to popular “allergy bombs,” aka essential oil cocktails. It is good to get away from pharmaceuticals and over the counter drugs; don’t get me wrong. But if you’re simply swapping one out for the other, you’re not healing the underlying condition. Essential oils are not a substitute for a healthy diet. You cannot go on eating sugar and processed foods and just essential oil harder to make up for it. Using essential oils can’t replace using a good probiotic, which will actually change the bacterial content of your gut, and thereby create lasting change in your health. They also can’t replace healing a child’s behavioral disorder like ADHD from the inside with diet changes like the GAPS diet. In fact, I’ve tried lots of essential oils for calming and they have never had any affect on my hyperactive kid. Just like I’ve never had any luck with using essential oils to calm my child, I’ve never had luck using them to heal an infection, get rid of a cough or cold or the flu, or improve gut health. It’s just not what they do. When I need to tackle an illness, I reach for teas and tinctures. Using herbs in tea and tincture form has been much more effective for our family than essential oils for clearing a respiratory infection or calming a cough, balancing neurotransmitters and calming a child, and kicking everything from sinus infections to Lyme disease. or taking herbal capsules, which contain an herb or herb mixture and are easy to quickly swallow for quick and simple usage. Based on my personal experience of using herbs in these ways and getting outstanding results, healing my family, and never having had any significant improvement with essential oils, I just can’t say that essential oils are as effective as other herbal remedies. Here’s where things get dicey. I have always been turned off by the marketing ploys of essential oils companies. Everyone who uses X company says their oils are the best and purest, and everyone who uses Y company says the same about theirs. The problem with this is that there are a lot of wonderful essential oil companies making excellent products for reasonable prices, and no one trusts them because the bigger companies have done such a great job marketing their oils as the best, and convincing you that buying cheaper oils isn’t safe. I think it’s great that I have friends who have been able to make a living selling essential oils and that those products have really improved their families’ lives. I don’t fault anyone for that. And if you’re most comfortable with and already love one brand, I don’t see anything wrong with that. P.S. I love using this inexpensive, high quality brand! When I first started using essential oils, they weren’t very well-known. I used them to scent homemade lotions and soaps. That was about it. These days, everyone uses essential oils, and for all kinds of things. Again, not necessarily a bad thing, but I’ve never felt comfortable with some of the information and “education” floating around about essential oils. Lots of people promote taking essential oils internally, which I have personally never condoned, as they can be hard on the liver to process, and even do damage to tissues and organs. And, of course, there’s the promotion of using them to create a healthy lifestyle, which, as discussed, cannot be accomplished without major lifestyle changes. Here is what is telling to me: members of popular MLMs frequently promote using essential oils internally or to heal various ailments, while personal friends and family members of mine who are trained in aromatherapy and essential oil usage have told me they would never take essential oils internally, nor do they promote them as a solution to health problems. I wonder if essential oil safety is always the top priority with so much misinformation floating around. keeping my home smelling nice. I stopped using candles and other toxic fragrance sources years ago, so I switched over to using a diffuser, which allows me to let the subtle aromas of essential oils keep my home smelling like four little boys don’t live here (although they do). I have an inexpensive diffuser that I’ve used for years and love diffusing this germ-fighting blend, and this super calming and soothing blend. keeping my home clean. I make a simple all-purpose cleaner from water, germ-fighting essential oils, and a tablespoon or two of Dr. Bronner’s castile soap and keep it in a spray bottle for cleaning everything from toilets to counter tops. It’s inexpensive, effective, and it smells really good. minor skin conditions. I love using an all-purpose salve for everything from stings, to scrapes, burns, and bruises. If I burn myself cooking, I slather on a little salve, which contains both herb-infused oils and essential oils, or I’ll use a combination of lavender and frankincense essential oils, which I have actually found to be very effective for soothing the skin and promoting healing. headaches. I’ve mentioned in this post about getting rid of migraines that I do use a little peppermint oil on pain points when I have a headache or migraine. However, if I’m eating well and getting plenty of sleep, as well as minding my stress levels, I rarely get headaches, which I why I suggest healing the underlying conditions through lifestyle changes rather than relying on essential oils to mask the problem. I’m just not that into essential oils. To each their own, and my own is not turning to essential oils when illness strikes. That doesn’t mean they’re bad or that I don’t have plenty of uses for them, I’m just not sure they are worthy of the pedestal they’re placed on in the healthy living community. 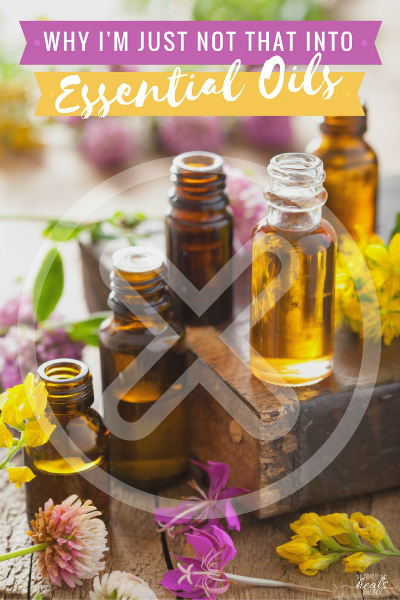 If you want to learn more about using essential oils, for one day only, you can grab the Herbs and Essential Oils Super Bundle here. Do you like using essential oils? 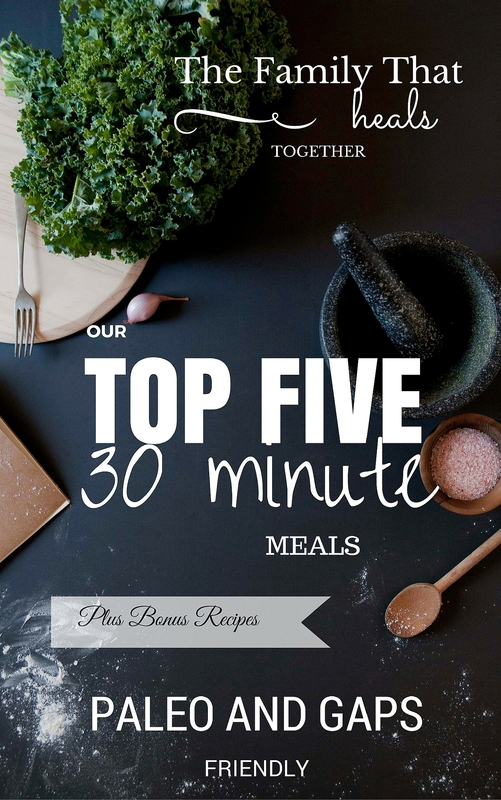 Share this post and generate a conversation! I LOVE this post! I’ve actually wondered where you stood on all this and I’m so glad you wrote a piece about it. I totally agree with you – essential oils are NOT a cure all, and gut health and diet and exercise are critical when it comes to health. I have seen amazing results from using essential oils safely with my family and know thousands of others who have also had wonderful benefits, but the amount of misinformation out there is scary! I love educating people about the safest ways to use essential oils, and directing them to research that shows how they benefit the body in so many ways, even using interally. I’ve done countless hours of reseach, not just on oils, but on aromatherapy schools and herbalist courses to try and find the best sources of information available. I love that there is so much on pubmed showing how the components of an oil interact with the body. Thank you for sharing your thoughts about this and I love that you support people in their pursuit of health and provide so many awesome resources to guide people in their wellness journey. Love you friend! I could not like this post more! It is exactly where I stand! Well done friend! As far as essential oil marketing, I agree to a certain extent. There does seem to be an “essential oils war” (which I am totally against), but at the same time I want to point out that EVERY company markets their products. Everyone makes an attempt to sell their products, just as you have affiliations to certain companies on your blog because you believe in their products. Everyone has to do their own research and determine what is the best product based on quality. Essential oils take more research, in my opinion, because the market is not regulated. “Natural” is not defined by the FDA (not that I’m a fan of the FDA, but it does set certain standards such as the organic label that is intended for food). 98% of the oils on the market are toxic or diluted, which is very scary, that’s why I recommend a brand that I trust, based on research and quality (although I recognize there are other high-quality brands out there). Price does not necessarily equate quality, but at the same time it can indicate whether the producer is using true, unadulterated essential oils. (Most essential oil companies simply bottle and label, they don’t actually produce the oils – with the exception of one company that I know of). There simply is not enough plant supply in the world to meet the demand, thus if you are only paying $20 for a set of essential oils, you can question what you are getting. Highest quality does cost to produce; just as growing food organically involves more cost (hand weeding is more labor intensive than dumping chemicals via airplane). For another example, Gut Pro is a very high quality probiotic that truly benefits health, but it costs about $100. Would you ever recommend Culturelle simply because it’s way less expensive ($16) yet claims to be a “good probiotic”? In my opinion, recommending sub-par essential oils is the problem that leads to misinformation and misuse of essential oils. The reason that people are injured by essential oils is because they are using oils that are diluted or cut with toxic chemicals and are uninformed. I would NEVER recommend anyone take diluted or toxic essential oils internally, as you mentioned that would cause bodily harm, especially liver damage (because one of the functions of the liver is to cleanse your blood.) However, just as pure herbs and spices are safe for internal use, so are essential oils. Essential oils are distilled from medicinal and edible plants. (Of course not all essential oils are safe to take internally – it depends on the plant) If they are pure and unadulterated there should be no health risk if used appropriately. Cinnamon and Clove are anti-microbial and have been studied to be extremely beneficial to health and fighting viruses. If you would cook with those spices, then why would you not take them internally as an essential oil, if that oil were pure? I personally take a blend of cinnamon, clove and other oils in my tea daily to support my immune system. I have never had any adverse reaction and have noted positive health changes. Do you recommend lemon for detox? Lemon is known and has been studied for it’s cleansing of the lymph system and is highly effective for detox. Lemon essential oil is more concentrated than lemons and more cost effective than buying organic lemons and making detox lemonade. This is just my opinion, and I am just pointing a few things out about taking them internally. However, I recognize that it is preference, and stress that the oils have to be totally pure. I stress to people that not all oils are safe (just like herbs, supplements, and foods). Just because something is on the grocery store shelf does not mean we should consume it, whether it’s Cheetos or Now brand essential oil. Those are my thoughts. I totally agree with you and I have training in herbs, homeopathy, aromatherapy, nutrition, TCM, and osteopathy. I use essential oils. But honestly in my ointments and herbal oils. I make cleaning sprays and creams and add them to them, but if someone gets a cold or flu or headache, the first thing I reach for is my homeopathic remedies and herbs. 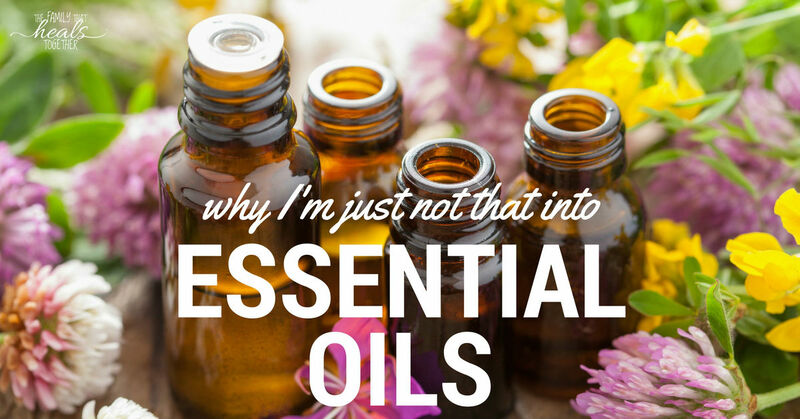 I do find essential oils are great but like you said, there are other things that work much better and are what I use first. Yes! I could have written this exact post; well ok not exactly, but I share all of your sentiments.